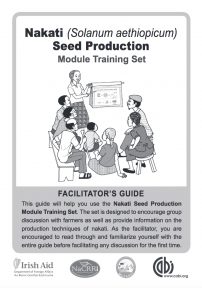 This guide will help you use the Nakati Seed Production Module Training Set. The set is designed to encourage group discussion with farmers as well as provide information on the production techniques of nakati. As the facilitator, you are encouraged to read through and familiarize yourself with the entire guide before facilitating any discussion for the first time.